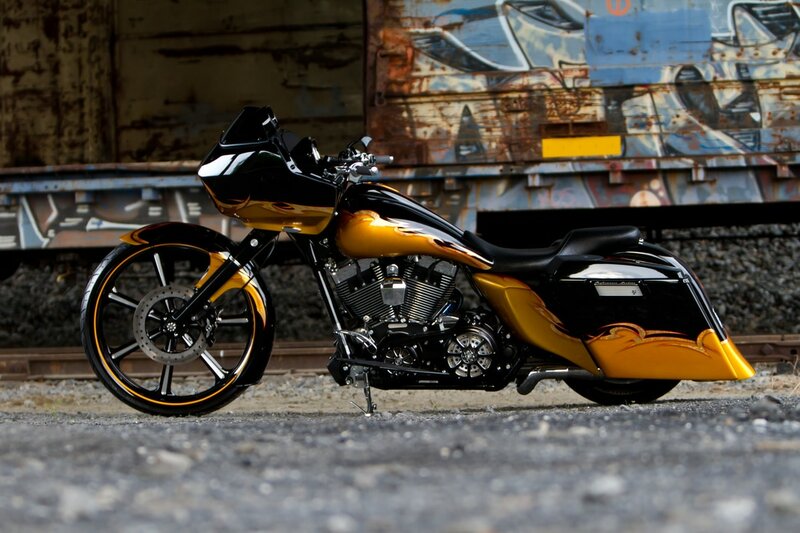 ​Once upon a time, a bagger motorcycle was considered your old man’s ride of choice. Have you looked around lately? 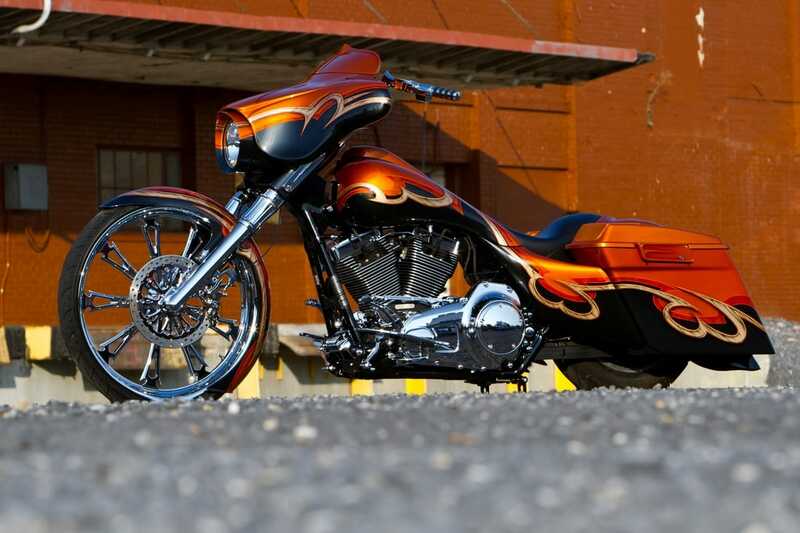 Harley Davidson custom built baggers are the iron royalty of the motorcycle world! Here at Rankin Creek Custom Cycles, We know that it’s the ride that counts and the looks that seal the deal. with the custom bike show circuit. 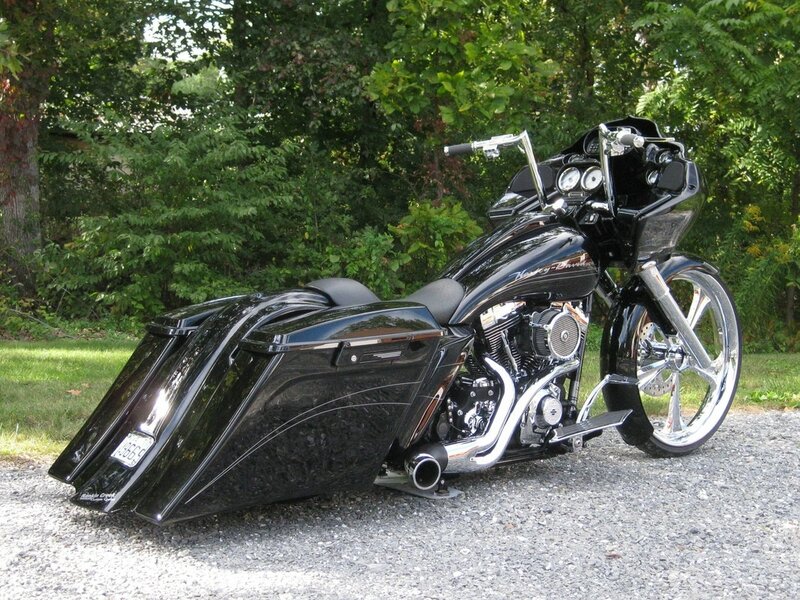 We customize your bagger project right down to the last detail and we’re damn proud of it. ​When you come into our shop asking for a custom build, you’ll only get the highest quality parts--some are one off custom made in house--no cheap-o stuff, big front wheels, and a luxury custom paint job. We make sure every part of the bike building process is just the way you want it. We know that the front end sets the standard for the rest of the machine. That's why our bikes are built with the correct rake and trail on the front end. Extended bags with speakers and liners follow the clean smooth lines of your bike. Cap all of this off with some Rankin Creek Custom Cycles special TLC and an eye popping custom paint job to complete your dream project! We add in all the extras you want on your bike. From mild to wild, it’s unparalleled quality, class and excellence all the way. From your first standard bike to choppers and now baggers, you’ve ridden a motorcycle because of the freedom. It’s a love affair like no other. Now, 35 or so years later, it’s still a love affair you can’t let go of. And with good reason. Baggers are custom therapy medication for a crazy world! At Rankin Creek Custom Cycles, we engineer your latest bike obsession to improve style and to enhance the ride, all the while ramping up the cool factor. It’s a high performance motorcycle that runs as smooth as it looks. These aren’t just “trailer queen show bikes”, they are built to be ridden, and ridden hard. We wouldn’t have it any other way. Art is from Detroit. He contacted me about a build for his 2011 H-D Road Glide. When I asked him how he wanted the bike customized, this is what he said. I want a black front end, black and yellow paint with the full pimp treatment. The first thing I did was to upgrade the 23-inch front wheel to 26 inches. That meant more modifications which included cutting the stock neck off and installing an HHI with an additional 9 degrees of rake, and stretching the frame to fit the massive Colorado Custom wheel. I also upgraded the primary, grips, latches, calipers, and air cleaner. I installed an Arnott air suspension to slam the custom rear fender to the ground. Then my crew and I fitted the rest of the bike with Sinister Industries accessories, plus my other usual top shelf components. We think the paint job pulls together a truly great bike. ​My buddy, Chad McCreay, of Copperhead Graphics, came up with the perfect paint design, black with pagan gold and a real gold leaf graphic design. Art approved the design and we were off. When the work was completed, Art was blown away. It was exactly what he wanted. Just goes to show that there are no rules for what the cool guy’s bike should look like, huh? And yes, I love what I do. For more information, just fill out the form above. I'd be happy to share my bagger passion with you. Motorcycle lovers follow us on Facebook!